Wednesday, the Senate Committee on Regulated Industries unanimously voted to submit SPB 7120. The bill would limit the on-premises sale of beer and other malt beverages by breweries to growlers—re-usable, typically glass containers—in quart, half-gallon and gallon sizes. 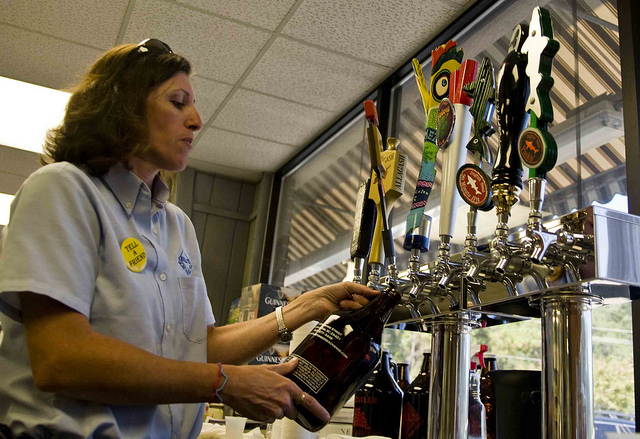 A liquor store employee fills a 64 oz, or half-gallon, growler in South Carolina. Sale of the size is currently prohibited in Florida. While the bill does enable sale of the 64 ounce, or half-gallon, growlers, which is currently illegal, it restricts brewers from selling self-produced bottled or canned beer. Breweries would be required to sell their packaged beverages to distributors and buy them back before selling them in taprooms or brewpubs. 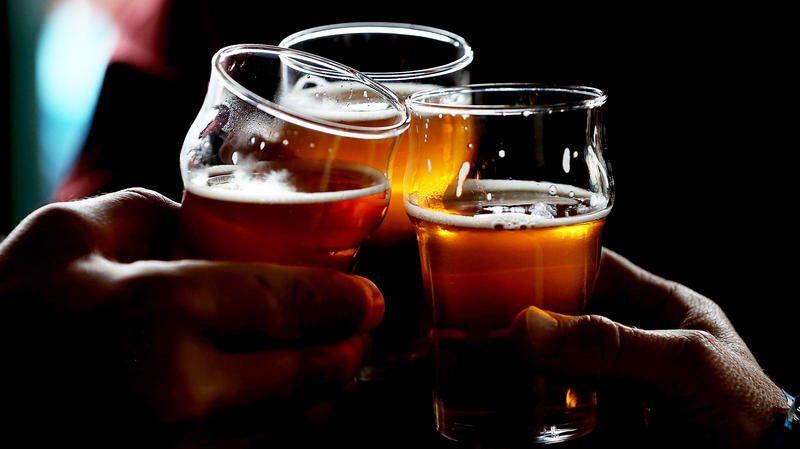 "It's a bad bill for our industry," said Ben Davis, founder of Intuition Ale Works. 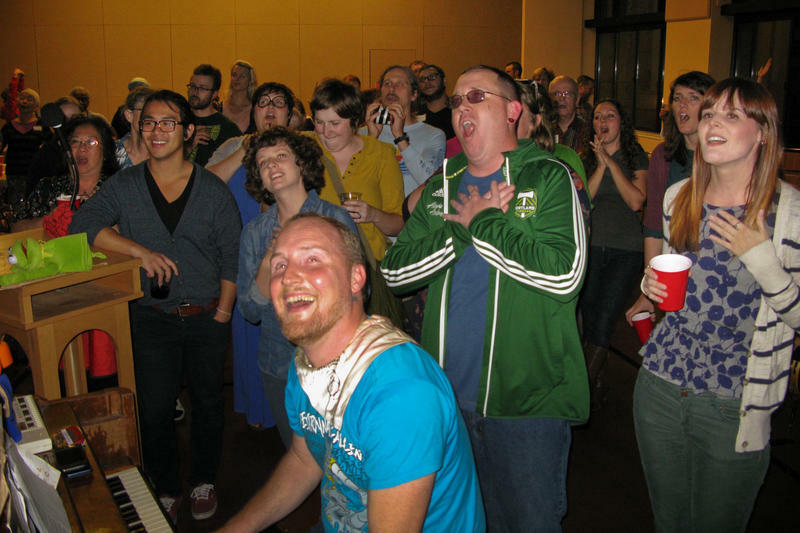 "It gives us half-gallon growlers, which is what we want, but it hurts us so much in the taproom." For startup craft breweries, Davis said, the ability to sell packaged beer at a taproom is vital when developing a profitable business. He said the addition of distributors as a "middle man" could mean a markup of up to 40 percent for local breweries to sell their own packaged products. "If you look at other states where craft beer is a very healthy and vibrant business, Florida is kind of going in the other direction," he said. "Does it make much sense for me to produce a product on site and then sell it to a distributor and buy it back to sell it?" said Brian Miller, owner and director of brewery operations for Bold City Brewery. Miller understands why distributors would support the measure—Bold City Brewery doesn't sell packaged beer at their taproom in deference to local retailers—but stressed the importance of allowing the practice for new breweries. "It does bring people in who don't know about your brand," he said. "For us, our taproom supported us for the first year, before you build up that distribution side." Miller also noted what he described as the underestimated tourism draw of craft breweries. 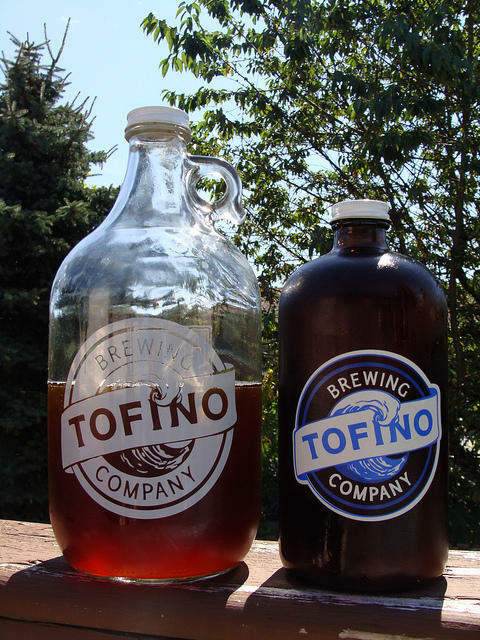 A 64 ounce growler, left, next to a 32 ounce growler. 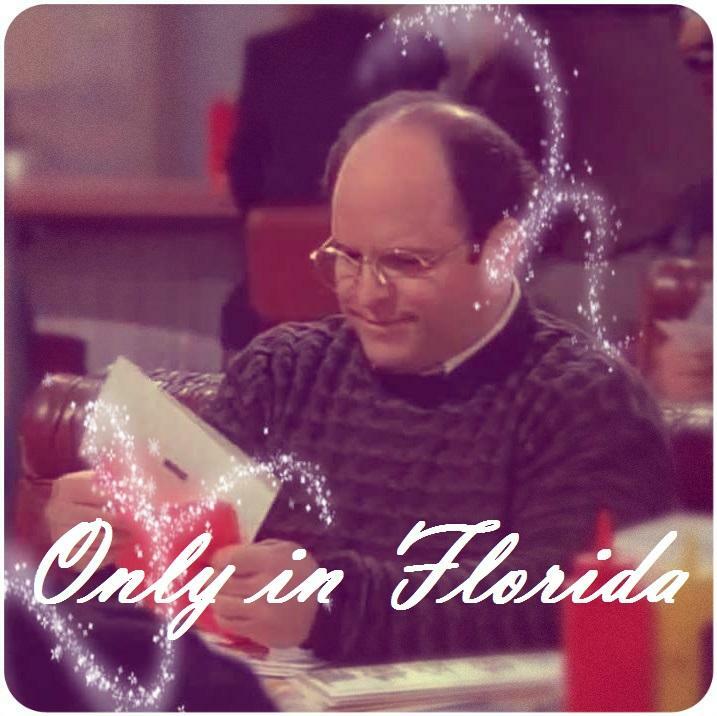 "That's a huge thing for tourism and revenue for the state of Florida," he said. Ron Gamble is the owner and brewmaster at Veterans United Craft Brewery, a Jacksonville craft brewery set to open later this year. "It just doesn't seem logical to me," he said of the distribution proposal. "That's where we're going to be getting a lot of our profits from." Gamble, Brian Miller and Ben Davis agreed that the addition of the 64 ounce growler would help local craft breweries. "To me that was the only size," said Gamble, who learned the trade at several east coast breweries before deciding to open his own in Jacksonville. "It's the industry standard," said Davis, noting that 64 ounces equals four pints, enough to share a full glass with up to three other people. "It makes us look like a second-rate craft beer state," he said. "There's no reason to be against it." Last week, beer giant Anheuser-Busch issued a statement that they support deregulating growler sizes in the state. Davis, along with other Florida craft brewers, support another bill which allows the sale of 64 ounce growlers and authorizes beer tastings at grocery stores and other previously prohibited venues without the distribution regulations (HB 283.) Debate on that bill was postponed Thursday during a meeting of the Florida House Regulatory Affairs Committee. Representatives of Jacksonville-based beverage distributor North Florida Sales and Pompano Beach-based Gold Coast Beverage Distributors did not reply to requests for comment in time for publication. If you think craft beer is seemingly everywhere these days, there's good reason. 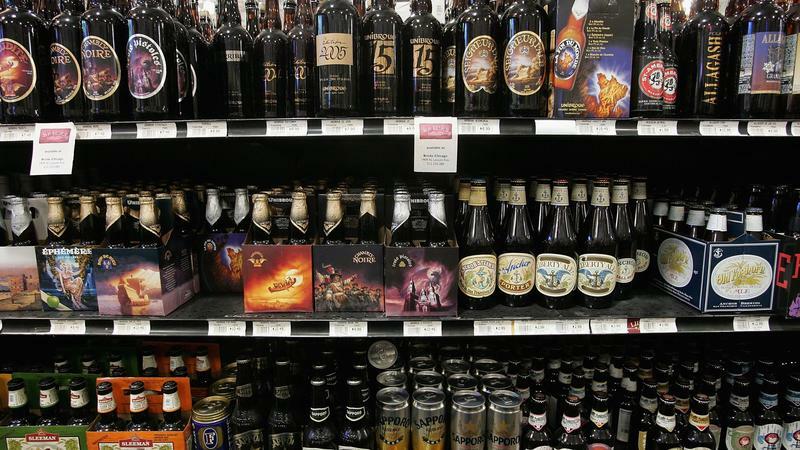 From bars and restaurants to supermarket aisles, the selection of locally made, often quirkily named brews has grown at an exponential rate.